Last autumn, the Norwegian Library Association celebrated its 100th anniversary. Around the same time Crown Princess Mette-Marit got the idea to put together a literature train, literally. I want to inspire people to read more! And I want to put the focus on how important libraries are in our society. Together with the Norwegian railroad company and the librarians at Deichman municipal library in Oslo she pulled together a project of a literary train ride through parts of northern/mid-Norway. The thought behind the Literature train is that people shall be able to join in and share reading experiences that have meant something for them in life. At every station children, young adults or adults can come and tell about important experiences they have had while they have been reading. I look forward to that. A special wagon for the train was designed by NSB to be the library and there would be a book café. The librarians at Deichman had packed together all the books; they were ready to be picked up by the Court. Then came the information: Crown Princess Mette-Marit had been put on sick leave and the train ride was cancelled. After the sick leave was over, and 2014 had started, the plans picked up again. The Crown Princess attended a literary event in the beginning of February at the Literature House in Oslo, and was asked to show which books she had on her bedside table. In the past week, in the beginning of April, the train ride took place. The librarian at Deichman showed off the packed crates. It had been agreed that it would be the easiest to coordinate if one library took responsibility for stocking the library car. In Norway the National Lending Card lets you check out books from the majority of libraries, not just your local one, and return them from whichever library you would like. So the books borrowed on the train from Deichman library (practically in Oslo) could be returned on the local libraries which would ship them back to Deichman. The reading campaign started with the hashtag #minbok (mybook) on Twitter. People were encouraged to share their book memories and recommendations there. Mette-Marit showed off the reading and work that she was doing at home to select the books that she thought should be a part of the train. The collection of books in the train library was partially selected by the Crown Princess, partially by her friends and family, and members of the court – and the librarians at Deichman supplied with more modern children and young adult literature. Before the train started, the Crown Princess was interviewed by NRK through Twitter – probably one of the first royals, if not the first, to conduct an entire interview through the medium. The whole interview was put together on Storify.
.@NRKbok Jeg hadde lyst å formidle min store leseglede. Jeg er også glad i tog. På tog reiser vi langsomt. Som i bøkene. Crown Princess Mette-Marit has been a reader for a long time, and shared some of it through Twitter, and more of it through interviews during the trip. It becomes personal to share the books that have been important to one. To me it has been nice to take a look back and see who I have become also through the books I have read. Retrospectively you see what have shaped you, and how important some things have been to you, especially in your youth. The following story rings especially true for me – I’m also frequently walking and reading. Though I haven’t yet hit a lamp post while doing it, there have been some near misses. I was walking and reading while I walked. I remember the feeling that I was so into the story, and walked along, and I walked into a lamp post. I understood then that I had to give up and sit down on a bench to finish the book. It says a bit about my relationship with literature. Once I get into a book, I can be difficult to get a hold of . The progamme for the train ride. Each station had a theme. Literature for breaking taboos – the difficult conversations. My books – the favourites of the Crown Princess. Shakespeare – master of language. Afterwards, Mette-Marit got some good feedback from the Norwegian Blue Cross about opening up about her relationship with her father and sharing that he was an alcoholic, thus making it less of a taboo. It was also pointed out that the controlled sharing of information about problematic subjects had been common in the Norwegian royal house for the last decade or so, and that such a thing is less common out in the European royal houses. 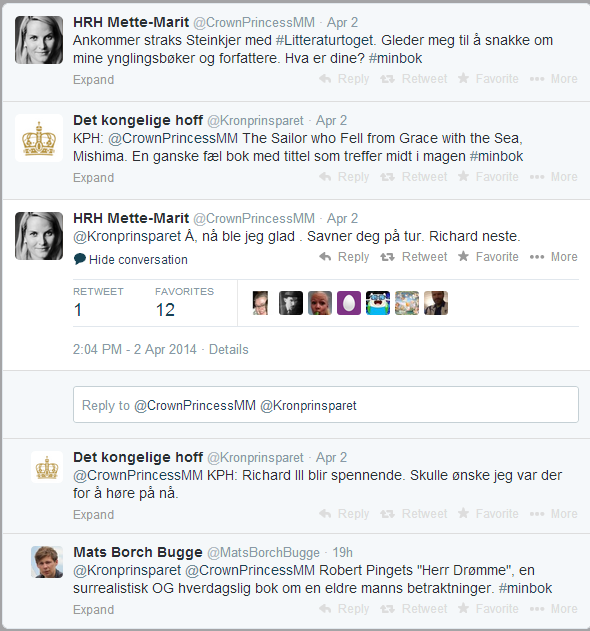 There was also time for some Twitter conversation back and forth between the Crown Princess and her husband. 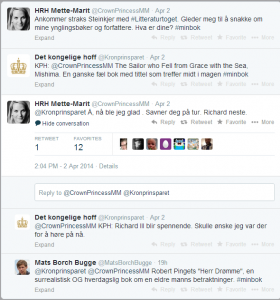 Conversation between Crown Princess Mette-Marit and Crown Prince Haakon on Twitter. Mette-Marit said that she missed him on the road, and that Richard would be next. The Crown Prince thought that the talk on Richard III would be interesting. And that he wished he was there. Mette-Marit wrote her master’s thesis about Richard III. News in English about the train ride.